Ah, the agony of defeat...or in this case the agony of "de leg".as Sylvia (Arnold) Regehr has just returned home from a trip to the hospital following a fall which resulted in a broken leg. We're told it's the femur (pl. femurs or femora), or thigh bone, which now has a metal rod repair. Sylvia is reportedly doing well (under the circumstances) and we wish her well in getting back to normal. Sylvia Regehr 306 Greenbay Rd. 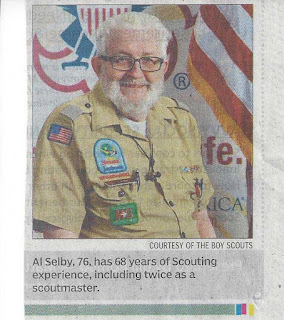 ...A Scout lifer...Al Selby, Mint Hill resident, 76, has 68 years’ Scouting experience, including twice as a scoutmaster. He spent 32 years with Troop 158 at Third Presbyterian Church in Charlotte and has served the Scouts in numerous capacities. Selby said the only person he knows of with more Scouting experience locally is Bill Nichols (70 years), who is on the executive committee of the Mecklenburg County Council Boy Scouts of America. “It’s a very close fraternity that gets passed down through generations. I can’t think of anything that would substitute for it,” said Selby. A longtime member of the Eagle Scout committee, Selby said 277 Eagles were honored last year and they spent more than 27,000 hours on projects. He said this level of service will be a focus when the council celebrates its 100th anniversary in 2015. More than 12,000 youths ages 7-18 are served each year through the council.